For today's Dress Up post, it's not necessarily a particular dress being featured, but a style and idea--sequins and glitter! When the holidays start to roll around, nearly every store has some sort of garment covered in glitz. Now that the holidays are in full-swing, it's almost as if the sparkling lights adorning the neighborhoods have found their way indoors and onto the clothes. When it comes to sequins, I'm not picky. Gold, matte gunmetal, pale pink or anywhere in between and I'm ready to throw it on and twirl. That can't be just me, right? With sparkly dresses specifically, I've found that I'm more a fan of simple silhouettes. The sequins say plenty enough and having a simple shape keeps the focus on the shine and allows you to appreciate the quality of the sparkle in itself without being distracted from the style of the dress. Although, I've got to admit, when anything is covered in sparkles I automatically pay attention. 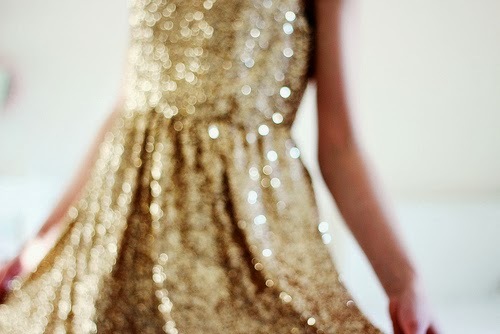 Have you all found any sparkly holiday dresses for Christmas or New Years yet? Surprisingly, I only own one. The dark navy sequins and open back keeps it exactly as I like it--simple but statement-making and reserved for special occasions. Happy Friday and happy hunting! What are you all up to this weekend? I'm heading to Austin, TX for a road trip with the family for some much needed outdoor trails and killer vintage. This girl needs a new pair of cowboy boots! This is a beautiful dress and I can see it being worn for many different sorts of occasions. Women's fashion these days has changed and new styles are being worn every year. I think 2014 will spark a new trend such as Day Dresses because they can also be worn for different occasions throughout the year.